What would you do if you lost a pet? Where would you go if you found one? At the Rainbow Street Shelter a cockatoo will greet you and a little round dog will make you welcome. All the animals there need children to be their friends. Meet Bear the border collie, Buster the marmalade cat, and Bessy the goat, as well as rabbits and guinea pigs and mice. There's even a pony called Pebbles, but where does a lion cub fit in? Wendy Orr was born in Edmonton, Canada, and spent her childhood in various places across Canada, France and the USA, but wherever she lived, there were lots of stories, adventures and animals. Once, when her family sailed to a new home, the dogs wore life-jackets, but the guinea pigs had to stay in their cages. When she grew up and had her own family, she still had cats, guinea pigs, rabbits and horses at different times - and always dogs. Her most recent dog is Harry, an occasionally naughty but always delightful poodle-cross that she adopted from the Lort Smith Animal Shelter. Harry had a very bad start to life and Wendy and her husband feel very lucky that he has come to live with them, and that they can all be happy together. 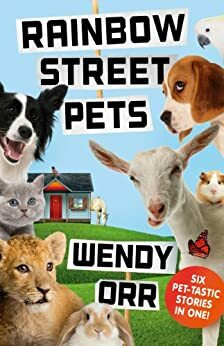 Wendy is the author of a number of award-winning books, including Nim's Island, Nim at Sea, Mokie and Bik, The Princess and her Panther, Raven's Mountain and for teenagers, Peeling the Onion.